It’s a noisy marketplace. How are you optimizing your online presence to make your voice heard? It starts with ensuring you are up to date on on-page SEO basics to provide peak performance for your website and visibility for your target audience. Over the past few years, the on-page “rules” have changed drastically as Google tries to ensure they’re delivering the best results. Now, a standard search result page shows pages that don’t necessary have the exact match query—or keyword—in their title tag or meta description. Now, we’re dealing with ranking algorithms that include Hummingbird, Panda, Rankbrain and semantic importance within the page. It takes into account all aspects of the webpage that, when added together, will improve your rankings in the search results. As Google becomes more sophisticated, one of the major factors influencing on-page optimization is relevance. How relevant is your page to the query? That’s how you have to think when you’re developing the page. Think of these tasks as a benefit to your end user. You have about eight seconds to influence a visitor to interact with your website. The more interaction and engagement, plus the longer your users stay on the site, the better their experience. Perhaps the most vital aspect of your on-page SEO efforts is the implementation of tags. Some are not as useful to SEO as they once were, but if written and utilized optimally, will improve your traffic. Meta tags are used to provide search engines with information about your page. To achieve high rankings, it has to do with relevance and user satisfaction, but including custom meta tags will influence users and increase your click-through-rate. There are multiple tags on your page. The most important is your title tag. The title is what users see in the search engines for both organic results and paid ads, and the words that appear at the top of each tab in your browser. The title tag outlines what the page is about. When ranking web pages for particular queries, Google looks at the title tag and compares that to the rest of the content on the page. However, the WordPress SEO plugin by Yoast allows you to create a custom title tag within the platform. Keep your title tags descriptive and short. Google recently increased the character limit for page titles to 70 characters before showing ellipses. Best practice is to ensure you stay below the character limit so your titles display properly. You can use Snippet Optimizer to simulate how your title and meta description will appear in SERPs. Use your title tag to stand out from your competitors, appealing to your visitors. Make sure all the pertinent information is included, including your keywords and location for local businesses. While it’s recommended to use your core keyword within the title, Google is shifting toward relevance and semantics in the results. Users aren’t blindly clicking on the first result, reading the titles and descriptions to find the best answer to their query. The meta description conveys what users will find on the page. While not a direct ranking factor, search engines read the meta descriptions to determine the page’s topic and the audience that will find value. A well-written meta description can generate a competitive advantage in the search results, creating a higher click-through rate with a greater chance of conversions. While there is a possibility that Google will omit the custom description and pull an excerpt of the content on the page, it is recommended that you fill in the meta description for every page of your site. The best way to check which pages are missing a meta description is to run your website through Screaming Frog’s SEO Spider. It shows you every URL under your domain, the meta description, and its length. Earlier in 2016, Google extended the length of descriptions for both desktop and mobile. For desktop, users will see up to 200 characters, while on mobile they’ll be shown up to 172 characters. To appeal to users on both devices, keep your description between 165 and 175 characters. Clearly outline what users will find on the page. Add your brand name and sprinkle in a keyword or two if they don’t sound forced. Think about synonyms and other terms that will get the point across. This is the first interaction many visitors have with your brand. Make it welcoming. Think of the meta description as your organic ad text. Tell users what’s in it for them to click through to your site. Include an offer or call to action to entice a click. You’ll also see some websites show multiple site links to direct users to the page they’re looking for. My company, 1SEO.com Digital Agency, has multiple pages you can click on to find out more about the agency. To find success and steady traffic to your site, it starts with your title and meta tags. Once you get the clicks, it’s up to your user experience and quality content to maintain engagement. Your landing page or blog should include multiple heading tags, from the h1 down to a potential h6. The most important is the h1. You should never have more than one h1 tag on any page. Include multiple h2’s or h3’s as users scroll down the page. These are used as subheadings. Use the headings to represent the different sections of the page. You’ll notice the impact from both an SEO standpoint and a usability standpoint. As an SEO factor, complementing the title of the page with the words used in your heading tags should provide users with a clear view of what the page is about. The search engine algorithm compares the section of content underneath each heading tag to establish relevancy. 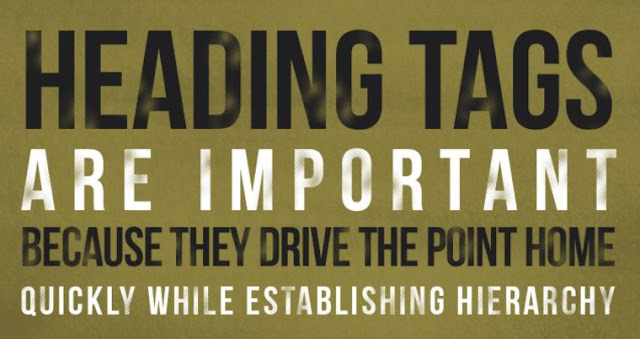 Your headings should be used to structure the page. Make sure the content supports the heading. The primary keyword of the page should be included somewhere in your h1 tag. Avoid skipping the h1 on a page, as it lets both your visitors and Google understand its subject. Many blogs, especially those in WordPress, automatically include the title of the blog post as an h1. Make sure to look at the HTML version of the page to ensure the h1 tag is present. When it comes to headings, there are factors you want to avoid to maintain your presence in the search engines, notably stuffing unnecessary keywords in the tags. Don’t use the same h1 tag on multiple pages of your site. 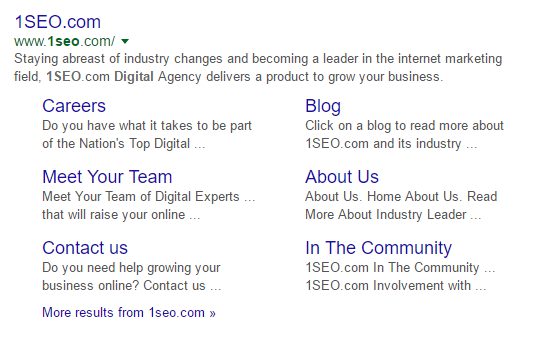 This can have harmful effects on your SEO as Google won’t know which page to rank for a query containing that heading. 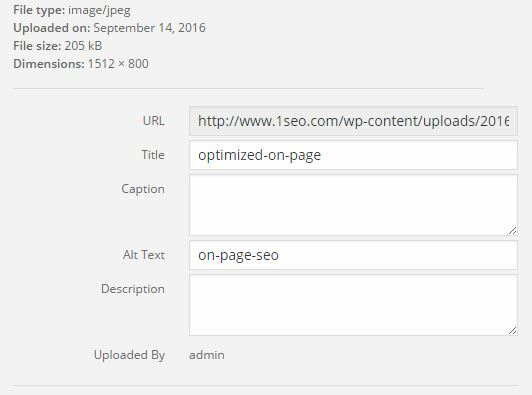 The Yoast SEO plugin on WordPress helps you understand how strong each page is. 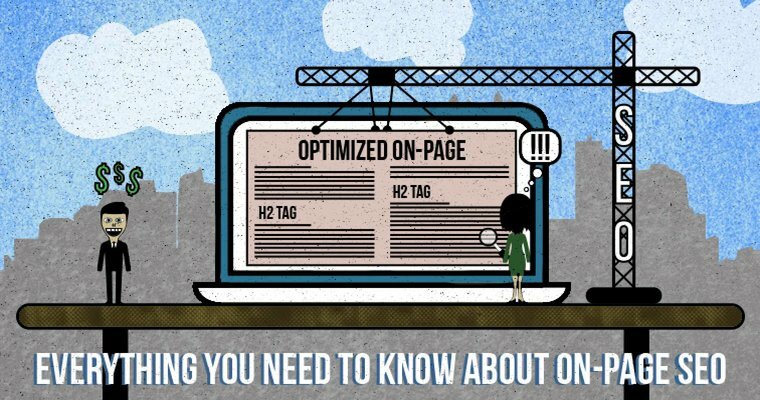 It analyzes on-page factors to help ensure your page is fully optimized. An added benefit, it alerts you of any issues with the page title, meta description, headings, images, content, and more. For landing pages and some blogs, keep in mind that your users are not reading the entire page. They’re scanning and browsing quickly, looking for a section that answers their questions or provides value. Headings and subheadings split up the page, making the presentation look cleaner. Subheadings help users navigate throughout the page. If you’re changing the subject or discussing a different aspect of the service, use h2s. If you break it down further and need a sub-sub-heading under an h2, use an h3 tag. Headings should not be overlooked. They hold more weight on the page than a standard paragraph tag or a bolded word. Always be sure to keep your readers in mind when writing headings. They shouldn’t sound—or read—like your forcing a keyword for the sake of further optimizing the page. When it comes to writing URL strings, they should be short, concise, and easily readable. How can we create the perfect URL string? When analyzing the length of URLs, Ahrefs found that shorter URLs tend to rank better. The study looked at the length of the URL and a number of folders. They counted each root domain as one folder, and each backslash after the root as another folder. From interior product or service pages to blog posts, the way we write URLs is an SEO practice that you must consider. Each word in your URL should be separated by a hyphen (-) and not an underscore (_). When you have two pages displaying almost the same content or information, set up a 301 redirect or canonicalization tag (rel=canonical) to the stronger page. This avoids duplicate content and shows Google which page to rank. Keep your URL short. The shorter the URL, the easier it is to share or embed while creating a better user experience. You want your readers to quickly identify what your page is about without seeing numbers, categories, symbols, or a mixture of everything included in the string. Utilize your primary keyword in the URL. Like other factors of on-page, don’t let your URL string sound unnatural or forced with keywords. Try to make it around five words, clearly outlining the information your users will find. Don’t leave your visitors left wondering what’s on the page before they click. The title, meta description, and URL should make it clear. As Google crawls your page, they’re looking to match user intent. Your content should clearly explain what product or service you’re offering, or the exact topic of your blog. The internet is cluttered with content, and it’s important that you ensure yours is unique. One of the most common sayings you’ll hear in the world of SEO and content marketing is “content is king.” In fact, SEO and content marketing do a lot of overlapping. They complement each other. Content involves the use of words—keywords—and writing for human value while still appeasing the search engines. This is what makes the foundation of SEO and the vast majority of your on-page. Think of content as having a conversation with your readers. Are they going to be interested or entertained? Or are they going to be bored and leave your site? When you create content, it must prove you’re an authority in your field. The best content speaks directly to your customers, shows them the value you offer and entices them to read further or contact your company. To improve your on-page and SEO to increase your traffic, content must solve a user’s problem while being well-written without spelling or grammatical errors. Be careful not to run into any problems by failing to adhere to the major Google algorithm updates. To help weed out the websites that achieved high rankings with spammy, keyword stuffed, and thin content, Google unleashed the Panda algorithm in February of 2011, updating it regularly. If you still have low quality and thin content, your website won’t be found online. Now, Panda is a core ranking signal, and you’ll receive a boost in rankings if you are consistently meeting the expectations of your users. While continuing to roll out and update, make sure you focus on creating quality content that is optimized for a high-volume keyword and is written with the user in mind. As we move into the age of artificial intelligence, SEOs and marketers have been trying to figure out the effects of Google RankBrain. The machine learning system was implemented around the spring of 2015, and has become the third highest ranking factor. Responsive Teqnologies was put into place to help determine how to rank queries there is no historical data for. It has since evolved and is used in almost every query to affect the rankings of most searches, so be sure to optimize your content for the ranking signal! For best practice, answer user’s questions in the least amount of time as possible. Google is garnering the ability to learn user intent and return the best results, especially with the rise of voice and natural language searches. Look at the long-tail queries and use a conversational approach to your content. While keywords play a significant role with your on-page SEO, Google is using semantics more and more to deliver the best user experience. While you must maintain a user-friendly and authoritative tone, the focus keyword is still of vital importance. Like with your meta tags, you will either outline meta keywords for a product or service page that is targeting multiple queries, or a single focus keyword for blogs. All of this is available in WordPress pages and posts. But why is targeting a keyword important? Using them correctly will directly affect the return on your digital marketing investment. The more you understand about keywords, the better you will strategize with your marketing. Always make sure you’re providing the most value for your brand by targeting keywords that have search volume. To get the most of your on-page, perform keyword research and be confident your company can convert for the targeted terms. There’s nothing worse than appearing first in the results for a query that leads to zero conversions. Use Google AdWords Keyword Planner to see search volume, or analyze what your competitors are targeting with SEMRush. The Keyword Planner offers you similar variations of your keyword that you can include on the page for further optimization. Through content marketing, employ keywords strategically. Think about the types of keywords and what will work best for your company. Informational Keywords: A term like “on-page SEO” when a user wants to learn more about a topic. Transactional Keywords: Words targeting users looking to buy a product or service. Typically include adjectives like “best” or “top” and are more long-tail. Location-Based Keywords: When users are looking for a local business or physical location. To determine the relevance for a particular query, Google looks at LSI keywords, or synonyms for the searched keyword. LSI stands for Latent Semantic Indexing, determining patterns within the terms, topics, and concepts of a page. The content shouldn’t have just one focus keyword. Your goal with on-page SEO should be to rank for all synonyms and related queries. Back to the term relevancy. Though your focus keyword may have 50,000 monthly searches, your page can rank higher for the similar query that only has 1,000 monthly searches. Write content that will drive traffic from many related queries. The goal is to generate clicks and use the factors of your on-page to increase conversions. Links carry the most weight in your SEO. Earning links from quality sources and authority sites strengthens the domain, while linking internally throughout the site benefits the user experience and enhances your SEO. The actual practice of earning links is part of your off-page SEO strategy. Use additional content marketing, email outreach, and other creative ways to build links back to your site. Backlinko has published an all-inclusive guide to link building that offers value when you’re starting your link building campaign. Focusing on the page, internal linking to other pages of your site will strengthen the keywords and enable Google to determine where to rank a particular keyword. Linking internally—between service pages and blogs—helps improve the crawlability of your site, showing Google the site’s most important pages. If you include a new link on your homepage, it becomes easier for Google to see that you’ve updated your site with fresh content than crawling the entire site for the new material. The benefit of internal links is giving your audience further options to stay on your site. The more engagement to relevant pages, the more Google takes notice. Don’t put an internal link in every sentence, but include multiple links per page to bolster your SEO. When you’re adding images to the page, it benefits the user experience. But, you can also help your SEO strategy by optimizing the image. Make your top targeted keyword the alt text and create a title that is unique, but stays applicable to the image. The featured image of this article has a unique title and the alt-text of what this post is about. Here’s the value of the alt tag. Think about when the image won’t load, what will the user see? The alt tag. Don’t stuff your keywords into alt tags. Make sure they fit with the image and make the picture relevant. Images play a crucial role in conversions. For SEO purposes, make sure they’re scaled correctly. The larger the image, the longer your page will take to load. Scale the image appropriately and make sure it shows in the smallest possible size. We’re living in a visual world, and while content is the most important, make sure your images are capturing attention, as well. For your page to be found relevant and your on-page SEO to improve, your website needs to be mobile-friendly and responsive in 2016 and beyond. Responsive websites provide the same experience with your brand no matter what device they’re using. There are multiple benefits to making your website responsive and appeal to mobile users. You’ll see a positive ranking signal thanks to the 2015 Mobile Algorithm Update that continues its aim to provide the best results. Over 50% of users are spending their time browsing and searching on mobile devices over desktops. Use the Mobile-Friendly Test Tool to understand how a Googlebot is viewing your page. To continue to provide users with the fastest and best experience, Google started showing Accelerated Mobile Pages (AMP) in the search results. Mainly beneficial for news outlets and articles, these pages load instantly and are easily identified with a lightning bolt symbol. The faster the load time, the more appealing it is for mobile users. You can learn all about AMP and its impact on your SEO in this article by Responsive Teqnologies staff member Sagar Patel. Remember that when users access your website or blog, chances are they’ll be on their mobile device. You can check to ensure your website is mobile friendly through Google’s test tool. If your site is not mobile-friendly, Google will outline what you can do to fix the issue. You’ll satisfy your customers with its functionality, making your website more relevant. In today’s technology age, speed is essential. We don’t want to wait. If a page isn’t loading right away, we find another website that will. Are you helping or hurting your user’s experience? Nearly half of all mobile users will leave a site if it doesn’t load within 3 seconds. Backlinko.com found that fast-loading websites are significantly more likely to rank in Google. Keeping visitors happy increases your conversion rate. According to an infographic from Kissmetrics, 58% of mobile users expect your mobile site to load as fast, if not faster, than the experience seen on a desktop. Optimize the site and take care of underlying factors that will shed some seconds off the page load time. Look at your site and see if there is anything slowing down the speed. According to a report from Radware, image compression and optimization are vital factors in the speed of your website. The study says that images hold 50 to 60% of the total weight of the page. If your image files are too large, they could be dragging down the site’s performance. There are tools you can use to ensure the performance of your site is up to your—and your visitors—standards. If you have a Google Analytics account, you can look at your site speed under the “Behavior” tab in the left sidebar. 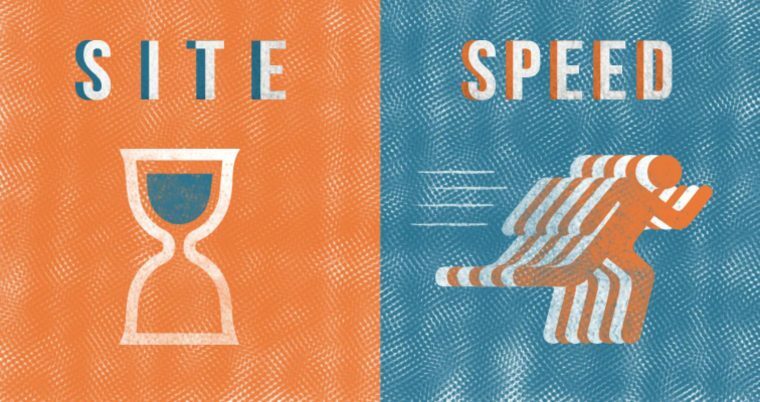 The faster your website loads, the more engagement you’ll receive. 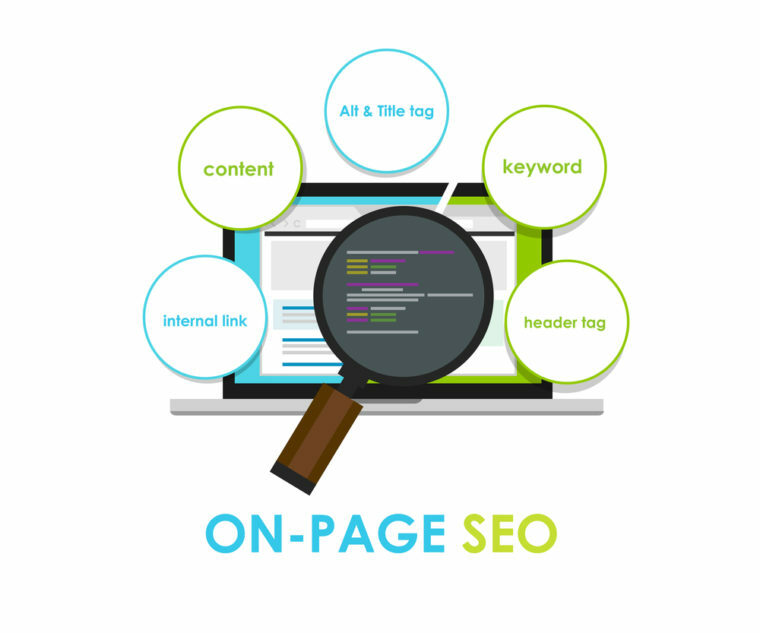 Once all other on-page SEO factors are in place, focus on minimizing the load time. Your customers will prefer your site to others. From the top down, make the use of your website seamless. From the appearance of the page to the backend technical aspects to the optimized meta information, the perfectly optimized page incorporates all aspects. Ensure you’re providing Google with the right signals. Implement custom meta tags, title tags, headings, and always write quality content. Provide your visitors with the information they want, and learn how they interact with your site through analytical tracking. That goes into the technical side of SEO, away from the techniques and optimization strategies included on the page. When everything is in place, look into your Google Analytics and Google Search Console (Webmaster Tools) to see how your site is performing. As search engines cache and crawl your page, are they running into any crawl errors? This could hinder your performance. Crawl errors include broken links, dynamic pages, 404s, errors in the robots.txt files, sitemap errors, and more. Using some of the SEO tools and resources I have outlined in SEJ’s Beginners Guide to SEO, you can test the performance of the site and see if you have any crawl errors. This means that some pages are not accessed easily by the search engine bots. Google lets you address and update the health of your entire site. Your goal is to generate conversions. Implementing these on-page SEO tactics will set a strong foundation that informs Google and entices your users. It will increase traffic, improve your search engine rankings for the most relevant keywords to your business, and drive leads. Do you have everything implemented for the perfectly optimized page? How are your results?